Next year might just be the best year mankind and for that matter Mother Earth too, has had in ages. 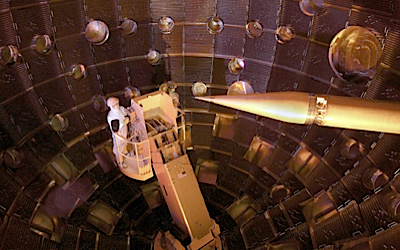 If scientists at Lawrence Livermore National Lab succeed our energy problems will be history after 2010. They are planning to shoot world’s most powerful laser at a tiny pellet containing a few milligrams of deuterium and tritium, isotopes of hydrogen that can be extracted from water. If all goes well they will create a reaction like the one that takes place at the center of the sun, producing an endless supply of safe, clean energy. This would mean nuclear fusion, the holy grail of clean energy, would finally become reality. But doesn’t this sound too good to be true? Some scientists think so. They warn it’s all ’snake oil’. Newsweek visited the lab about an hour’s drive east of San Francisco.